Having household pets or having structured contact with animals is proving to be a great complement to the management of autism. More important still, many opine that atypical qualities unique to individuals on the spectrum make animal-related careers viable options in adulthood. Dr. Temple Grandin, in her book “Animals in Translation”, considered her limited language skills early in life and hypersensitivity to visual or auditory stimuli -- manifestations of her autism -- as factors that fuelled her ability to decode animal behavior and that contributed to her success as an animal scientist. And here’s what our angel talker Mona Magno-Veluz, ASP National Board Secretary (aka blogger Mighty Magulang), found out about the topic. As early as the 1970s, David Nathanson’s research concluded that being around dolphins could increase the attention of children with autism, enhance cognitive activities, help them learn faster, and retain information longer. More recent studies showcased in the Western Journal of Nursing Research disclosed the effects of interaction between children with autism spectrum disorders and dogs; where they observed that children who played with the live dog were in a better mood and more aware of their surroundings than the children who were exposed to a ball or a stuffed toy. 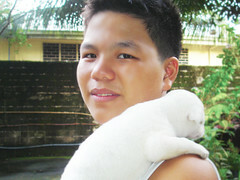 The Philippine Animal Welfare Society (PAWS) launched the Dr. Dog Campaign in 1997. The program recognizes the comfort and joy brought to pediatric cancer patients after interaction with dogs. Children, who were once withdrawn, spoke to the dogs and expressed excitement to their family members and hospital staff after the Dr. Dog visits. Pet Therapy. Aside from giving the children the opportunity to be responsible for the animals’ needs, pets help CWAs communicate and interact. And what animals make good pets for children with autism? Dogs, cats, birds, horses, guinea pigs and hamsters have proven to be effective in various studies. But as behaviors of specific animals vary as much as behaviors of humans, the search for the perfect companion is a personal adventure of discovery. Parents would have to decide, based on their living situation and their child’s abilities and preferences, what makes the most sense. 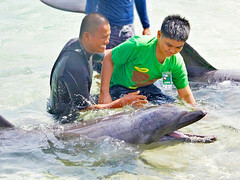 Dolphin-Assisted Therapy. Proponents of this method report that the exposure of children suffering from neurological or neuro-developmental disorders to specially-trained dolphins lengthened attention spans, improved emotional control, minimized ritual behavior and increased the desire to communicate in study respondents. While the effectiveness of this therapy is challenged, water-immersed play provides, at the very least, calming tactile stimulation to children who are sensitive to touch. Autism Assistance Dogs. It is unfortunate that assistance dogs have not yet reached mainstream popularity in the Philippines. They have been limited to defense, patrol and search canines. Many public facilities like malls and hospitals do not allow dogs to enter their establishments, much less differentiate between regular pets and support dogs. But many countries in the First World, like the United States, United Kingdom and Australia have successfully deployed rigorously-trained autism service dogs to help PWAs gain independence, and confidence to perform daily living activities by providing sensory processing support. Macky has learned to handle puppies with gentle care. He no longer squeezes them. Hippotherapy. Exposure to horses has been clinically proven to change brainwave patterns, according to Franklin Levinson, an expert in Equine Facilitated Learning (EFL). Riding horses allows individuals with autism to live in the now, minimizing stimming or moving repetitively to stimulate one or more senses. According to Monette Rosario, horse-trainer, riding coach and owner of the Marikina Equestrian Center, hippotherapy requires specially-trained horses and she looks forward to the day when she could partner with a therapy center to pioneer this method in the country. In the meantime, volunteers from the Riding for the Disabled Association, a local affiliate of the UK-based charity, provide one-on-one recreational riding for PWAs at the Manila Polo Club Stables. Parents and educators in the autism sector are always on the lookout for, if not alternative therapy modalities, simply the opportunity to bring joy to our children on the spectrum and enrich their lives. Perhaps we should go beyond our comfort zones and discover for ourselves if animals hold the key.